U.S. Ambassador to the United Nations Nikki Haley gave a very well-received speech at the American Israel Public Affairs Committee conference Monday. She said that Israel gets bullied at the United Nations and that she, and the U.S., won’t stand for it anymore. "At the UN and throughout the UN agencies, Israel does get bullied,” she said. “It gets bullied because the countries that don't like Israel are used to being able to get away with it, that just doesn't sit well with me." “I have absolutely no patience for bullying,” she emphasized. "We will not stand for it any longer." Haley discussed exercising U.S. veto power at the UN to block a Security Council resolution condemning the White House’s move to recognize Jerusalem as Israel's capital in December. "We will not tolerate a situation that a world body of 198 countries can spend half their time attacking one country: Israel," Haley said. "What used to be a monthly Israel bashing session now at least has more balance. But we're never gonna put up with bullying." Haley praised President Trump’s decision to move the U.S. embassy to Jerusalam. 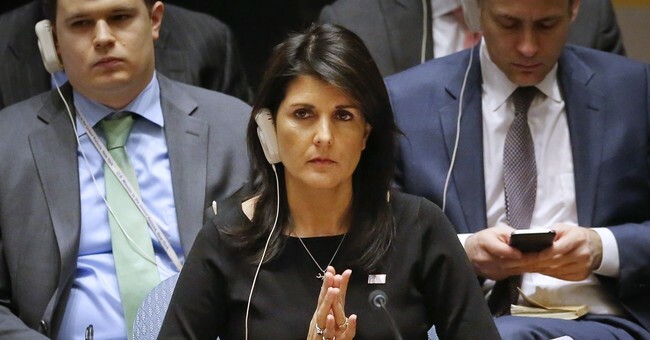 Haley defended the U.S.’s “favoritism” towards Israel.